Start or interrupt your hop-on hop-off sightseeing tour of Berlin at stop Straße des 17. 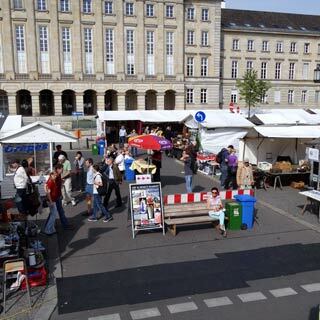 Juni/Flohmarkt. Originally designed as connecting road between City and Charlottenburg Palace, the Straße des 17. Juni (17th of June Street) is now part of the great east-west axis in Berlin. The street is dedicated to the memory of the popular uprising in the GDR in 1953. At the Flohmarkt (Flea Market) on Straße des 17. Juni, an original Berlin flea market, thousands of visitors from around the world and hundreds of traders meet together every Saturday and Sunday between 10:00 a.m. and 5 p.m.